Following the 3. (German) Twitter Wein Awards event in the Kaiserstuhl region, Patrick Johner had invited us to visit him at Weingut Karl Heinz Johner and taste his wines. Patrick co-owns with his father Karl Heinz Johner both Weingut Karl Heinz Johner in Germany and the Johner Estate in New Zealand, so we had the chance to taste the wines from 2 wineries – in the Old and New Worlds. Patrick’s father, Karl Heinz Johner is an unusual winemaker. He spent the first 10 years or so of his professional career making wine in Kent, UK. In fact, he was one of the first, if not the first to produce English sparkler, which are increasingly gaining international recognition. He then returned to Germany in 1985, created Weingut Karl Heinz Johner and started to make wine in Germany. The wines were matured in barrique from the outset and were considered by the German wine establishment as so far away from what German wine should be that they could not be marketed as Qualitaets- or Preaedikatswein but only as table wines. He was also one of the first German winemakers to experiment with most concentration. An innovative wine cellar was built in the early 1990s, in a cloister style and with a circular barrique cellar, using Californian examples. Then, he got bored in Germany and decided to venture into winemaking in the New World. He created Johner Estate in New Zealand and now spends most of the time there, while he still keeps an eye on Weingut Karl Heinz Johner in Germany. Patrick followed in his father’s footsteps. He was born in the UK and speaks beautiful English. He studied, as his father, winemaking at the Geisenheim Wine College. He then did internships in the Bourgogne and Australia and travelled with his father around the world to eventually establish Johner Estate in New Zealand. He now got married, has a family with young children and is grounded in Germany. He runs Weingut Karl Heinz Johner in Baden as well as the sale operations of the two Johner wineries in Germany. In addition, Patrick Johner has emerged as one of the leaders of the web 2.0 scene in the German wine industry. Weingut Karl Heinz Johner is in Bischoffingen in the Kaiserstuhl area in the Baden wine region in Germany. The vineyard area totals 16,5 hectares, and is planted with Pinot Noir(5,8 ha), Pinot Gris (4,1 ha), Pinot Blanc (3,5 ha), Müller-Thurgau (1,9 ha), Chardonnay (0,4 ha) and Sauvignon Blanc (0,4 ha). Weingut Karl Heinz Johner has its own classification system. There are no references on the label to vineyard sites. All wines are either table wines or QbA (Qualitaetswein besonderer Anbaugebiete). The best wines come as reserve bottling, marketed as „SJ” (Selektion Johner). All wines are bottled with a screw-cap closure. Patrick Johner is now mainly responsible for the wines of Weingut Karl Heinz Johner. He has not changed anything but fully supports the innovations introduced by his father, for example, not to follow the traditional German wine classification system. Weingut Karl Heinz Johner is a 3 (out of 5) grapes producer in the Gault Millau WeinGuide Deutschland 2011 ranking. Annual production is around 100.000 bottles of wine. One of the wine success stories in the past couple of decades is New Zealand. New Zealand’s wine makers have penetrated the global wine market with stunning Sauvignon Blanc and Pinot Noir wines, but also with other grape varieties and sparklers. Pinot Noir and Sauvignon Blanc are New Zealand’s flagship grapes. New Zealand is a relatively small wine country, at about 10% of Germany’s wine output or 2% of France’s output, the world’s largest wine producer. The Johner Estate was established in 2001 by Karl Heinz and Patrick Johner. It is outside of Masterton in the northern Wairarapa Valley. Wairarapa is a young wine growing region north of Wellington over the Rimutaka Hills. The Johners have planted 8 ha of various Pinot Noir clones, originally selected in Burgundy, 3 ha of Sauvignon Blanc and a further hectare of 10 trial Varieties ranging from Pinot Gris to Syrah. 2002 saw the release of the first wine from the Johner Estate. Last year, for the first time, the Johner Estate was included in Mathew Luke’s Classification of New Zealand’s Top 60 Pinot Noir producers. Following the example of the 1855 Bordeaux classification, Matthew Juke has developed a New Zealand Pinot Noir Classification with 5 groups of winemakers. As far as I can see, Patrick Johner is – with Dirk Wuertz – the winemaker who is most present in the German web 2.0 wine world. In fact, I first got in touch with him through the internet. Last year, he organized a fascinating twitter wine tasting on Ustream.tv with a Skype connection to Karl Heinz in New Zealand. First, there was Patrick Johner sitting in the office of his winery in Baden, Germany, behind a monitor and with a head set on his head. He was orchestrating the whole show and broadcasting live through Ustream.tv. Second, Patrick was connected via Skype with his father Karl Heinz in New Zealand, who was also on-line. During the show, with his lap –top, connected to Ustream.tv via Skype , Karl Heinz was walking in the vineyard showing us the grapes, then showing us his cellar and finally also drinking the wine, while commenting on questions and remarks. Amazing pictures! Third, there were the viewers like me. Many of the viewers had ordered the wine before the show and were tasting with Patrick Johner and his father the Sauvignon Blanc from New Zealand. The viewers were watching and hearing the father in New Zealand in one window of the screen and Patrick in Baden in another window. They were all in their twitter accounts and sending out notes and questions via twitter. We were all reading the tweets, including Patrick Johner. He would select the more interesting ones and share them with his father. Then, his father would answer from New Zealand or Patrick would answer from Germany. All this was streamed live on Ustream.tv. 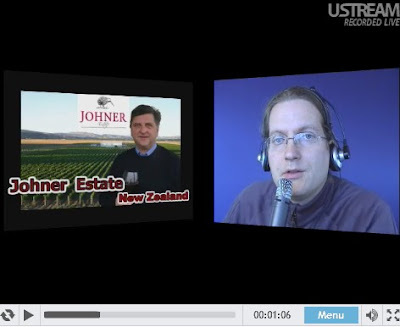 Picture: Patrick Johner's Twitter Wine Tasting on Ustream.tv with a Skype Connection to Karl Heinz Johner in New Zealand. Patrick took us through the wine portfolio of Weingut Karl Heinz Johner and the Johner Estate. The Weingut Karl Heinz Johner wine were divided into 4 groups. The exchange rates were Euro 1 = US$ 1.36 = BP 0.84 at the time of the drafting of this posting. First, white wines, comprising both regular wines with just the grape variety on the label (in the Euro 7 to 15 range) and the reserve bottling (SJ) for Euro 25 (Chardonnay, Grauer Burgunder and Weisser Burgunder). These are all bone-dry wines. Second, red wines, again regular red wines such as the 2007 Spaetburgunder vom Kaiserstul for Euro 10 and the reserve bottling (SJ). I was in particular impressed by the 2005 Blauer Spaetburgunder SJ for Euro 39. Third, dessert wines, all in a 0.375 liter bottle. This are lusciously sweet wines, including the 2008 Saint Patrick with 204 g/l remaining sugar for Euro 13. Forth, wines in small bottles. Some of the wines are bottled in the 0.375 liter bottle size, such as the 2008 Grauer Burgunder SJ for Euro 13.50. There were 6 white wines on the list, an off-dry 2009 Riesling for Euro 8.00, a 2009 Chardonnay for Euro 15 and 3 of the New Zealand flagship grape variety, Sauvignon Blanc, in the Euro 10 to 15 price range. Of course, the 2009 Noble Sauvignon Blanc Dessert wine in the 0.375 liter bottle for Euro 13 stood out. With regard to red wine, I was very much impressed by the 2009 Syrah for Euro 30. Three of the other wines were Pinot Noirs, including the 2009 Pinot Noir Wairarapa for Euro 10 and the 2007 Reserve Pinot Noir Gladstone for Euro 25. Finally, there were also two 2008 Cabernet Sauvignon and Merlot based blends for Euro 25 and Euro 30.